Rio Grande’s Clayton Surrell hit a home run in Saturday’s game one victory over Ohio Christian University. 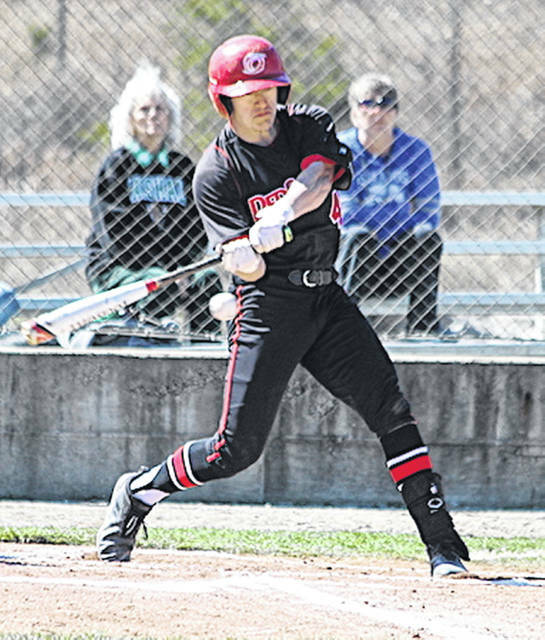 CIRCLEVILLE, Ohio — The University of Rio Grande jumped to a pair of early leads and cruised to a doubleheader sweep of Ohio Christian University, Saturday afternoon, in River States Conference baseball action at Olson Field. The RedStorm finished off the series sweep, taking the twin bill by scores of 7-3 and 5-0. Rio Grande improved to 30-15 overall and 14-7 in conference play as a result of the sweep. Ohio Christian finished the day at 11-27 overall and 4-16 in the RSC. In the opener, Rio scored twice in the first inning and twice in the third and was never headed. Freshman Clayton Surrell (Carroll, OH) and senior Roanderson Severino (Reading, PA) had run-scoring hits in the first inning, while Severino and junior Kent Reeser (Miamisburg, OH) both had sacrifice flies in the third. Surrell, who finished 2-for-4, also added a solo home run in the fourth inning. Senior David Rodriguez (Santo Domingo, D.R.) finished 3-for-5 – including a double – and drove in a run in the winning effort, while juniors Dylan Shockley (Minford, OH) and Eli Daniels (Minford, OH) and freshman Cole Dyer (Wheelersburg, OH) also had two hits in the victory. Junior Zach Kendall (Troy, OH) started and got the win for the RedStorm, allowing five hits and two unearned runs over 7-1/3 innings. He also walked two and struck out eight. Tanner Popp started and took the loss for OCU, surrendering nine hits and five runs over five innings. Ian Rycenga doubled and drove in a run for the Trailblazers, while Joe Henderson also had a double and Lance Easter hit a leadoff home run in the bottom of the ninth. Game two saw Rio Grande push across single runs in the first and third innings before scoring twice in the fourth and adding one more marker in the sixth. Meanwhile, senior right-hander Pierce Knisley (Chillicothe, OH) was stingy on the bump for the RedStorm, tossing a two-hit shutout with a pair of walks and six strikeouts in a complete game outing. Rycenga had both of OCU’s hits. Logan Hill started and lost for the Trailblazers, allowing eight hits and all five runs over six innings. Surrell had two hits and drove in three runs for Rio, while senior Michael Rodriguez also went 2-for-4 with a double and a run batted in. Shockley also had two hits, including a triple, and freshman Brandon Pritchard (Zanesville, OH) drove in a run. Rio Grande is scheduled to return to action on Tuesday with a non-conference game at Georgetown (Ky.) College.